Dreamt of owning Starry Night but too timid to pull off a heist at the Van Gogh Museum? 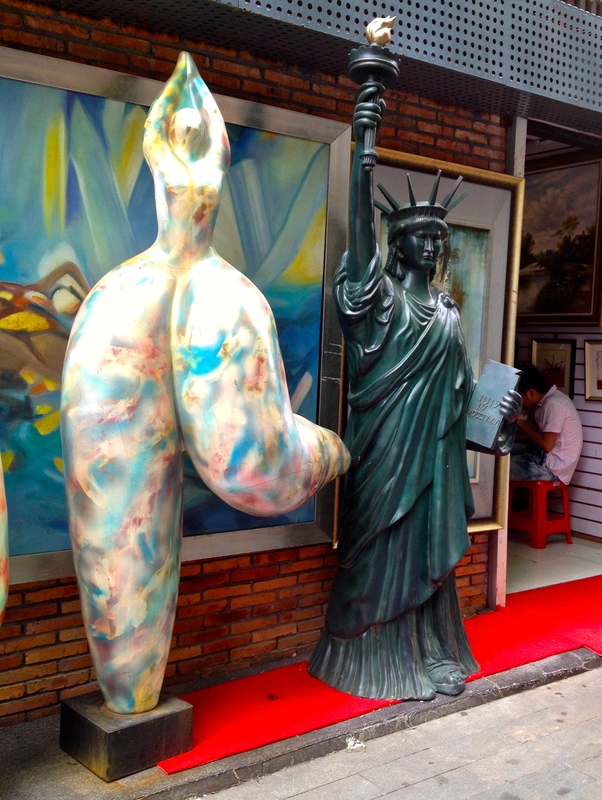 Then Shenzhen, China’s Dafen Art Village is your (relatively) lawful solution. 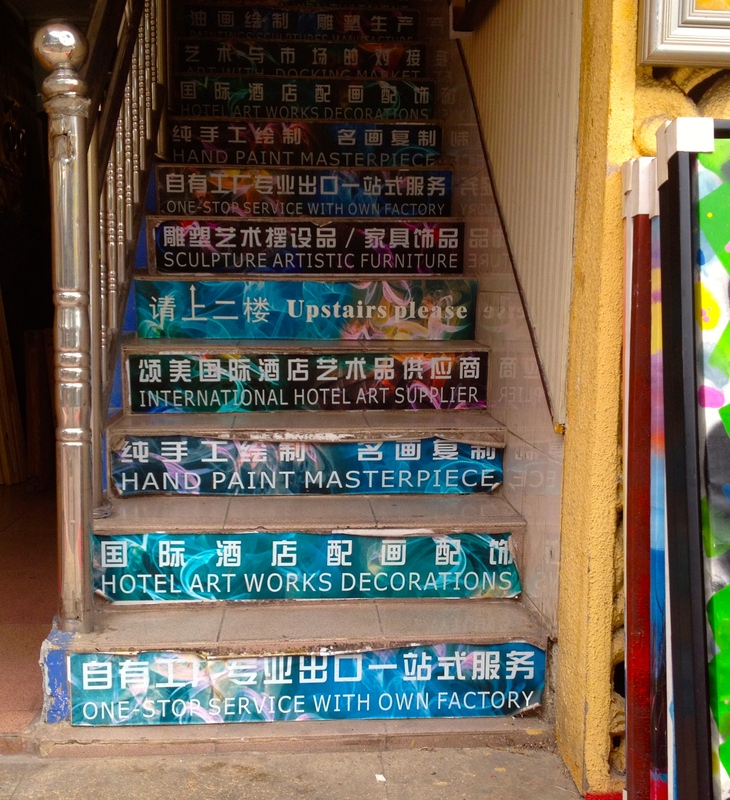 In this odd corner of the world, one can purchase a hand painted reproduction of anything for roughly 100 to 500 Chinese RMB (15 to 80 USD) depending on the size and quality desired. Twenty or so reproduction artists set up camp in Dafen in the early 1990s and since then many thousand have settled here to paint in the village’s copy workshops. 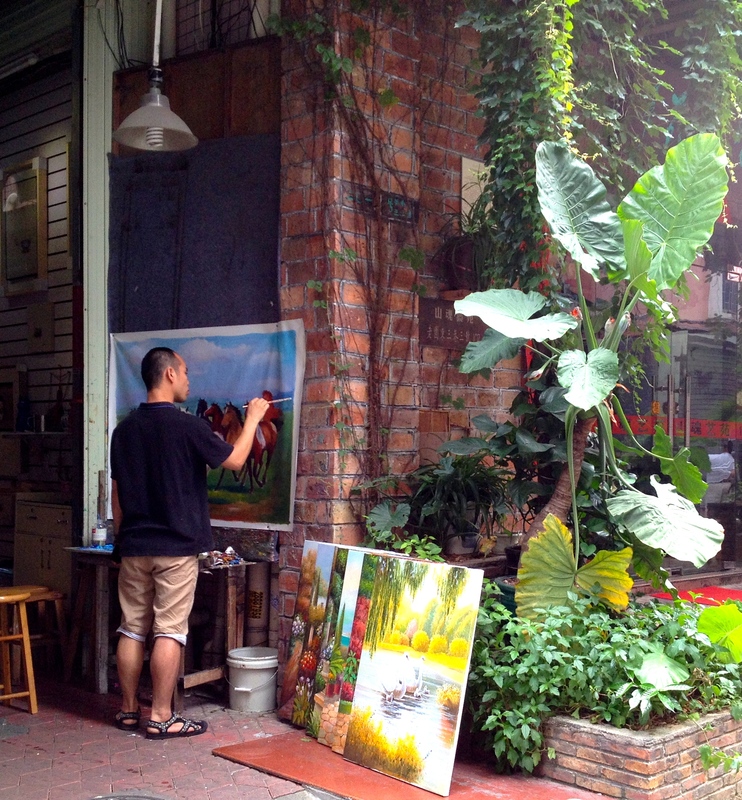 A sprinkling of real artists creating original art work have also taken up residence. One easy way to determine whether a particular shop specializes in copies or real art is simply to point at something you fancy and ask, “Do you have this smaller?” If they pull out a stack of duplicates in a range of sizes, you can peg the quality and price accordingly. 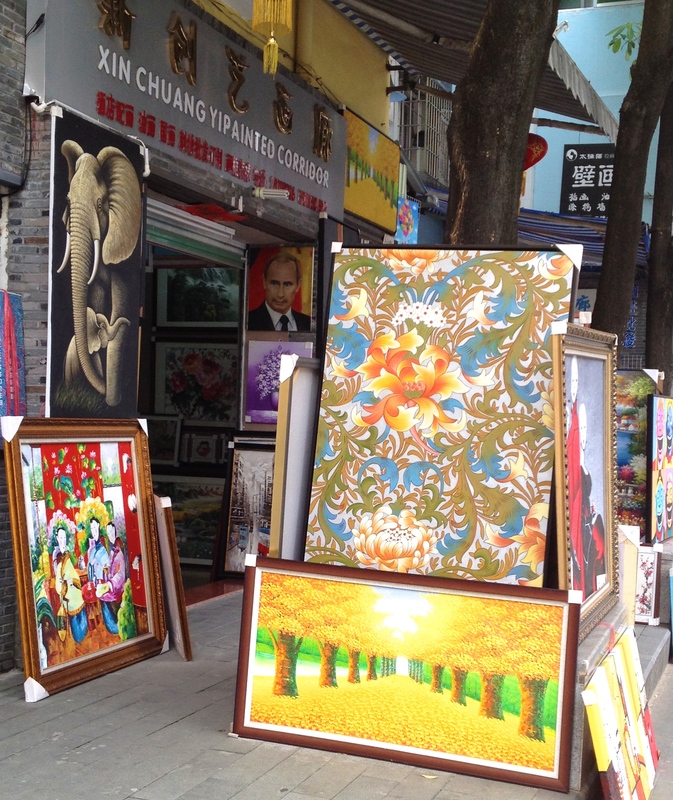 If you want your own portrait of Vladimir Putin (points for spotting him below), you can reach Dafen by taxi from Shenzhen’s Lo Wu Station in fifteen minutes for roughly 50 RMB. Show the taxi driver this: 大芬. How many copies of this horse painting will he knock out today? The next time you’re staring at the walls of a Motel 6 in Tulsa, think fondly of the Dafen artists. Would you like to signal your love of The Party at the same time you hint at your love of capitalist market-reform and smoking? Then this portrait of Deng Xiao Ping might be the one for your office! Does that mean you have a Mona Lisa hanging on your wall? We should do a price comparison! Haha… No. We actually haven’t bought any… They run about $50-1000 usd depending on size and quality. Nice! Love the red Bruce Lee! Fascinating location – looks like so much fun! Very odd place. 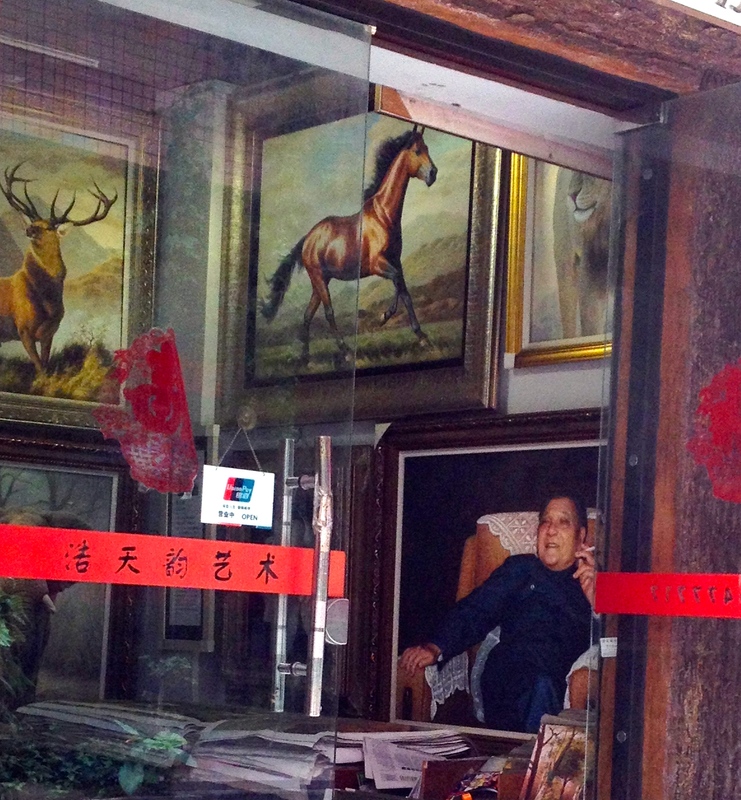 Have heard other cities in China have set up similar artists hot spots to lure copyists away from Dafen! If you’re willing to make two trips (one to place the order and one to pick up) you could have someone paint a portrait of your baby. They could even paint in a char siu bao! OMG, that’s a fabulous idea!!! Family portrait with a range of dim sum and roasted meats? I presume you’re shipping the Bruce Lee with you? Sadly, Bruce Lee didn’t make it back across the border to Hong Kong with me. Diverted by a quest for violent justice? Wow, this is a great place! Now I know where to get my portraits of Putin, thank god. :O Truly what dreams are made of! 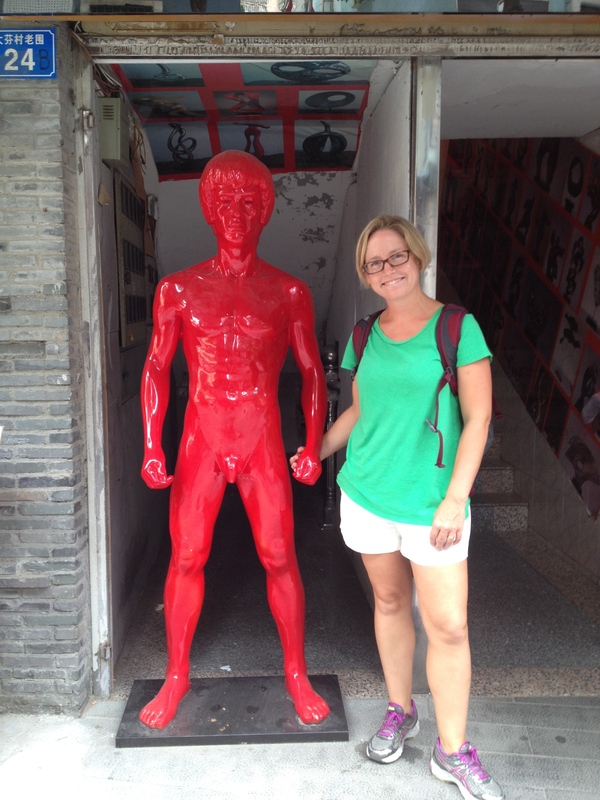 While working with an Australian businessman in the printing industry (in Shenzhen), I visited Dafen quite a lot. The metro wasn’t completed at that time, so it was a real slog getting there from just about anywhere. Anyway, numerous fumes were inhaled while negotiating deals for canvas pads and “Fepson”-type large-format printers. That the ceiling was low and the fumes perpetual made it feel like my boss and I had just landed in Beijing each time we paid our contact a visit. But what a place, hey? They probably supply every 2-star hotel and 富二代 with paintings of wispy trees and even wispier imaginations. Glad to supply a pleasant-ish (?) stroll down memory lane. Only buying two animal painting for my kids, I’m sure I only scratched the surface of the place. 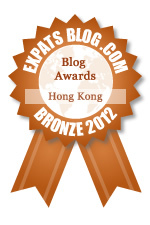 I will be in Hong Kong roughly from 7 July – 9 July. If you have time (you’re probably really busy packing though…if you haven’t already made it to Utrecht), would you like to meet? I will probably be staying in TST. Always just a few weeks out of sync! I’m not yet in a Utrecht, but have left Hong Kong and am in the US for the summer. I still need to go here. What did you purchase for your Holland home? Ha! I only purchased things for my kids’ bedrooms (basically an abstract picture of a lion and a colorful picture of a zebra). You could find some interesting things, but there is a lot of tat and it all started to bleed together in my vision! That said, some of the shops were clearly head and shoulders above the rest in terms of quality (and priced accordingly; in the end it seems you always get what you pay for…).